Chance encounter leads to rare collaboration. A rare collaboration between one of the world’s leading biopharmaceutical companies and a chemistry lab at a small liberal arts college began as the result of a chance encounter. Chemistry major Ariana Tribby ’17 was presenting a poster at the American Chemistry Society (ACS) National Meeting in Philadelphia in 2016 when her research, under the guidance of Assistant Professor of Chemistry Nicholas Ball, caught the attention of Pfizer’s Senior Principal Scientist Dr. Christopher am Ende. The biopharmaceutical giant was interested in Ball’s lab work using sulfonyl fluorides to make other sulfur-based molecules. Dr. am Ende was particularly interested in Ball’s work with sulfonamides. Sulfonyl fluorides have been used in biology for decades, are valued for their stability in water and bioactivity and are now emerging as precursors for a myriad of sulfur-based compounds. According to Ball, the stability of sulfonyl fluorides are more attractive over traditional routes using sulfonamides that require reagents that have a short self-life or undesirable side reactions. The key challenge for Pomona-Pfizer collaborative study was to figure out a way to unlock the reactivity of sulfonyl fluorides for the desired reaction. Sulfonamides are widely prevalent in the pharmaceutical and agrochemical industries. They represented 15 percent of the top 100 most prescribed drugs, with therapeutic applications against cardiovascular, infectious and neurological diseases in 2016. This mutual interest between Pfizer and the Ball Lab led to a year-long research partnership to develop a methodology to make sulfonamides from sulfonyl fluorides using calcium salts. Pfizer did the initial work to come up with a sketch for a synthetic route, while Ball’s lab work involved optimizing that synthetic route and testing its versatility. After countless hours in the lab–both at Pfizer and at Pomona–many teleconference calls and more than 100 chemical reactions later, the research team had found an optimal reaction by the end of the summer of 2017. The study was recently published as an open access article in Organic Letters, one of the most highly-regarded academic journals in organic chemistry. Their work will hopefully translate into more efficient ways to make a diverse array of sulfonamides, key for discovering new drug targets. The article’s authors include five Pomona students who worked with Ball: Cristian Woroch ’19, Mark Rusznak ’18, Ryan Franzese ’19, Sarah Etuk ’19 and Sabrina Kwan ’20, who are a mixture of chemistry and neuroscience majors. On Pfizer’s side, along with am Ende, the research and article author team includes scientists and medical chemists: Paramita Mukherjee, Matthew Reese, Joseph Tucker, John Humphrey, who work in Pfizer’s Worldwide Research and Development division. Leah Cleary of Ideaya Biosciences was also part of the team. 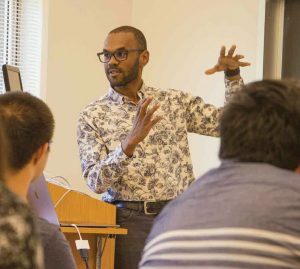 For Ball, the goal for students in his lab is to learn how to turn theory into practice, to critically work through scientific challenges and to understand and take ownership of their work. With this Pfizer study, Pomona students were able to better understand the applications of pharmaceutical and medicinal chemistry. Woroch, who was second author in the study, worked closely with both Ball and Pfizer’s am Ende. This project had such an influence on Woroch’s research interests that he is continuing to pursue the topic for his senior thesis, and am Ende will be a second reader for it. Woroch adds that the ability to apply science to real world problems is a big part of what drew him to research. “Particularly when projects are challenging or frustrating, having a practical application for your work is a driving force,” he says. According to ACS data from 2013, 53 percent of chemistry graduates are employed in industry sectors after attending graduate school, while 39 percent go to work in academia. Besides this research study, Ball, am Ende and Woroch share another commonality: They all received a Beckman Scholarship at some point in their chemistry research careers. The Beckman Foundation provides grants to researchers and nonprofit research institutions in chemistry and life sciences to promote scientific discoveries and to foster the invention of methods, instruments and materials that will open up new avenues of research.